After raising $16,000 from local merchants, farmers and individuals, the original founders of State Bank of Reeseville L.J. Bennett, F.J. Venie and A.C. Baker met to elect the first officers of the bank. F.J. Venie was elected President and M.F. Venie Vice President. The Certificate of Incorporation was dated September 18, 1902 with the first day of business commencing on October 1, 1902. During this same time the Village of Reeseville supported two community banks. On May 15, 1930 the State Bank of Reeseville approved the purchase of the Peoples State Bank of Reeseville, which was finalized on December 20, 1930. 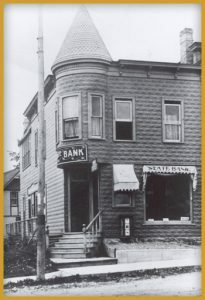 Thanks to the ongoing encouragement and support of customers, the bank continued to grow and prosper until 1932 when our country entered the “Great Depression.” On August 20, 1932 the State Banking Department advised the bank’s shareholders to sign voluntary assessments, which they all did, and in just two days the bank re-opened for business. The Board of Directors met and on November 24, 1933 resolved to become a member of the newly formed Federal Deposit Insurance Corporation (FDIC) fund which has become permanent with the bank’s customers deposits remaining insured as defined under present day eligibility. Our nation recovered from the effects of the depression as did the State Bank of Reeseville. We continued to expand our staff and our bank products and services. In January 1961, Gerald “Jerry” Yerges joined the bank and led the bank in new directions. Under his leadership, the bank acquired Clyman State Bank and established an office in Watertown. Jerry served as President & CEO of the bank and also was a member of the bank’s Board of Directors, a position he holds today. Jerry L. Adams, an experienced community banker, joined the bank as President & CEO and Board Member in March 2007. Under his leadership the bank continued to expand its product offerings and e-banking services. As we celebrate our future, it is appropriate to reflect on the principles and ideals of our founders. Their vision was to establish a locally owned and managed bank that provided the best possible financial solutions and services in the most courteous, professional manner. Your Board of Directors, Officers and Staff Members share this same vision today. We have become the community bank of choice for thousands of area residents because we have the financial solutions they need and want, the experienced professionals they know and trust, and our staff members provide the personal attention they deserve.